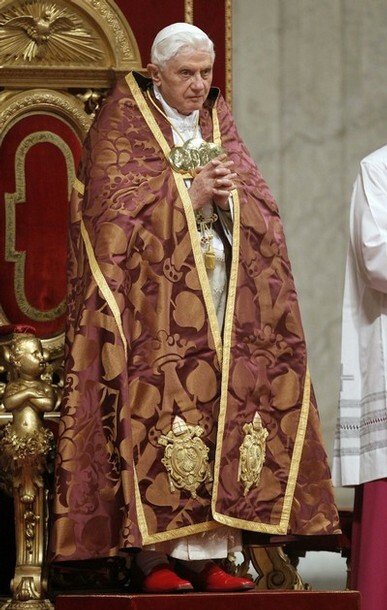 I've heard that the cope originated as a raincoat the priests would wear in outdoor processions, and it was never dropped as part of priestly vestments per the mode of the Church in general, not to drop traditional things. 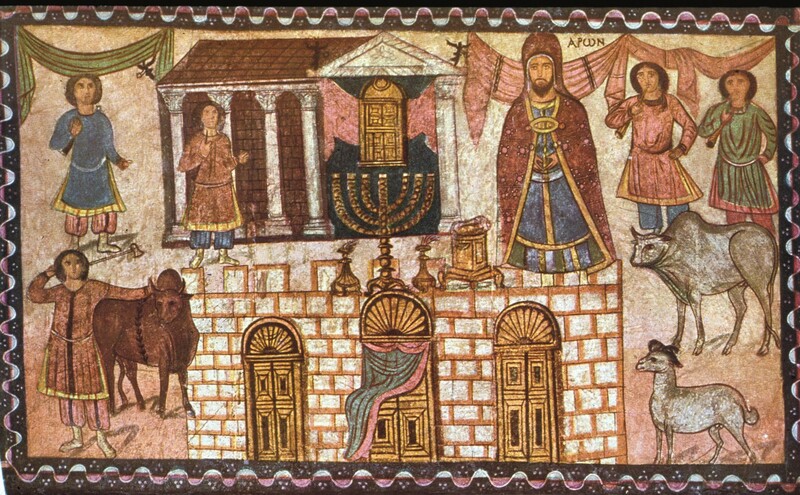 However, when looking at some photos of some paintings in the (one of, if not the) oldest (discovered) Synagogue—Dura Europos—, I was shocked to find what looked like a Cope (worn by priests, but especially part of the Papal regalia) on the Highpriest Aaron. Clearly its being the 'same thing' as what Aaron is wearing (a distinctly liturgical piece of clothing) is incompatible with its having been a raincoat which was 'never dropped.' But it could of course have been eventually changed to represent symbolically that the Pope is a kind of 'highpriest' among the other bishops (and bishops a kind of 'highpriest' over the priests, I guess you could say—a picture St. Clement draws in the first century), but I find it unlikely that they would have known this is what vestments Aaron wore would look like, as the language of the Bible isn't exactly unambiguous, and seems like more of a summary of the fact that God commanded holy vestments to be a thing. And some kind of 'divine recapiulation'/coincidence is more or less out of the question. I found this painting from just over 500 years ago, for instance. If it basically hasn't changed since then, the changes must be very, very gradual, meaning we can interpolate a much earlier date, then, for its origin. Just what is the origin of the 'highpriestly-looking' cope as used by the Church in her sacred vestments, and when did it first come into use? Does any source mention its development or what is the first mention of its use, for example? What are the origins of the cope? The Catholic Encyclopedia has a nice expose about the origins of the cope used in Catholic liturgical celebrations. Known in Latin as pluviale or cappa), a vestment which may most conveniently be described as a long liturgical mantle, open in front and fastened at the breast with a band or clasp. As existing monuments show, whether we look at pictorial representations or at the copes of early date which still survive, there has been remarkably little change in the character of the vestment from the earliest ages. The most conspicuous external modification which the cope has undergone, during the past thousand years and more, lies in a certain divergence in the shape of the hood, a feature which, after all, is not in any way an essential part of the vestment. In some early examples we find only a triangular hood, which was no doubt intended to of practical utility in covering the head in processions, etc. But with the lapse of time the hood has into a mere ornamental appendage, and it is quite commonly represented by a sort of shield of embroidery, artificially stiffened and sometimes adorned with a fringe, the whole being fastened by buttons or by some other device to the back of the below the broad orphrey which usually forms an upper border to the whole. The fact that in many early chasubles, as depicted in the drawings of the eighth and ninth centuries, we see clear traces of a primitive hood, thus bearing out the explicit statement upon the point of Isidore of Seville, strongly confirms the view that in their origin cope and chasuble were identical, the chasuble being only a cope with its edges sewn together. Basically, the cope as a liturgical vestment is employed in processions, benediction, assistant priests at pontifical Masses and other many other liturgical functions However it is not worn by priest who are celebrating the Eucharist at Mass (consecration). The cope is a vestment for processions worn by all ranks of the clergy when assisting at a liturgical function, but it is never worn by the priest and his sacred ministers in celebrating the Mass. At a Pontifical High Mass the cope was worn by the "assistant priest," a priest who assists the bishop who is the actual celebrant. In the Sarum Rite, the Cope was also prescribed for members of the choir at various times. But as the one can see in the Catholic Encyclopedia this is a serious simplification of the liturgical vestment. Any similarities in the above medieval painting displaying a cope as is used by Catholic clergy is merely an artists interpretation of what he thought to be worn by Jewish priests. In fact, the opposite is true. Jewish priests did not wear copes in their liturgy at all. There is no liturgical cope mentioned in Sacred Scriptures for Jewish priests. 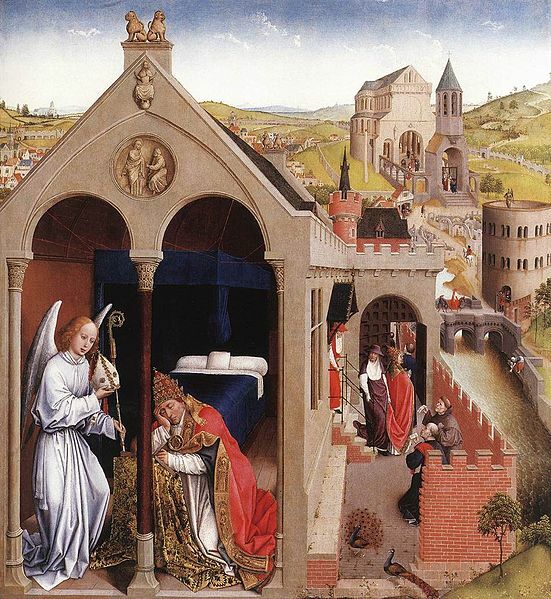 The only similarities that that exist in medieval art and the association between Catholic and Jewish vestments is in the eyes of the particular artist. It goes no further. The medieval liturgist might have said, "our clergy wear vestments because they were handed down to us from the clothing worn by the priests of the Old Testament, who in turn wore them by the express command of God in the law of Moses." This is a tall tale or at least a mistake because ancient Jewish and Christian vestments have only superficial similarities; and by the time the Church made use of vestments (after the end of Roman persecutions and the rise of Constantine, say) Jews and Christians had near zero cultural exchange. Indeed, it was more likely that a Christian would change his habits solely not appear like a Jew, and vice versa. Not the answer you're looking for? Browse other questions tagged catholicism origin vestments or ask your own question.